The home theater PC market has been rather dull for several years. Sure you can get a sound card with 7.1 surround sound, but they've generally been noisier than I'd want in my own home theater. You can purchase video cards that output to an HDTV and support HDCP, but the experience hasn't been on par with using home theater components. At Computex 2008, AMD is showing off a couple of new boards from MSI that change the game in important fundamental ways. First up AMD's 780 chipset supports Blu-ray and other HD video playback through integrated video on the motherboard. Nobody else can currently do this - Intel drops frames. Couple this with the MSI boards integrated component and HDMI out and you've got ease of use in getting the video portion of your PC signal easily to your television, without the nonsense of converting DVI to HDMI. You can of course still add a separate video card, but for normal home theater use it would not be necessary. The second key thing MSI and AMD have done is create something that grows with your audio needs. 2.1 surround (pre-amp) is included on the sound card with either analog outputs or digital. You can grow that to either 5.1 or 7.1 using an add-on card that easily extends your audio channels (That's the board in the front of the picture). 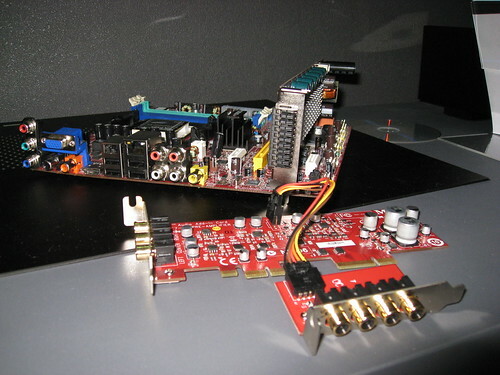 The board seated on the motherboard provides amplified 5.1 surround. Audio uses a D2Audio chip on the motherboard to prevent extraneous noise. A final component of this system is an ultra-quiet cooling system (pictured below). You're more likely to hear noise from your Blu-ray drive than you are from the fans keeping this entire thing cool. Best of all, I have it on good authority from a source at MSI that all this will be on the market by June 15, 2008 and you should be able to build a system (minus Blu-ray player) for under $1000.